Who says garlands are just for Christmas? Packing up the remains of Christmas always makes me sad, and as I was packing up the door hanger thing, I thought, well why not make another wreath? There are dozens of ideas on pinterest and elsewhere in internet land and I’ve noticed when watching American stuff on telly that they often have wreaths on their doors and not just as Christmas. So if our American friends can, why can’t I bring a little bit of America to my corner of Norfolk? It’s certainly no worse than flaky FBI agents yelling at us to “lock stuff down” through our televisions. I did consider getting some plastic flowers and attaching them to a willow wreath, but I couldn’t find the wreath, I think it’s in the loft somewhere along with a wasps nest and piles of old tat. So I opted for a rag wreath. On having a rummage, I found that I had quite a lot of scraps of fresh, zingy green too small to do anything with. I cut the scraps into strips 2cm wide and between 10cm and 20cm long. 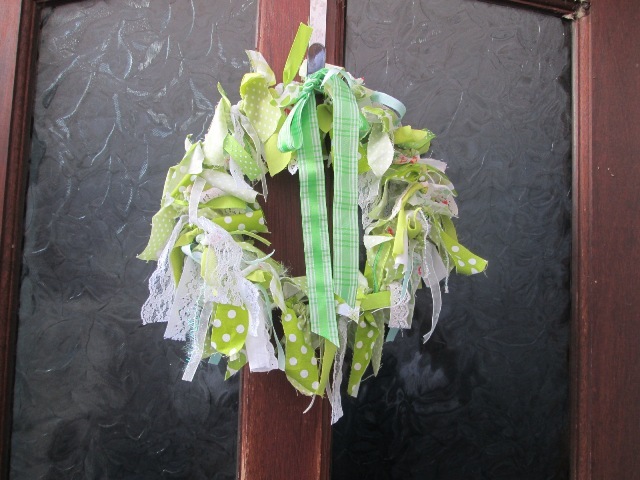 It didn’t look like enough to make a wreath so I had another rummage and found some bits of lace and broderie anglaise. I cut those up too and added them to my pile. To make the hoop I found some garden wire and twisted it into a circle. To hold the ends I wrapped some masking take around them. This also provided a marker so I didn’t forget where the top was. I started off with some plain green fabric strips, tying them onto the ring and spacing them out evenly. I then chose some other strips and tied those on in the spaces. And that was pretty much it! I just kept going until I ran out of strips, making sure that the different fabrics were evenly spaced out. I then tied on the lace and broderie anglaise where there were gaps. There are enough strips on the ring to hold them all in place. The hook stuck out quite a long way when I hung the wreath on it so I tied a piece of green ribbon around it to disguise it a bit. Boy 1’s friends mum admired it when she came round to pick friend up last week. She said it brightened up our alleyway and asked if she’d missed something! It was all very easy to do, it used up some odds and ends of fabric that were too small to do much else with and it only took me a couple of hours to make. Have any others of you made a garland for your door? I’d love to see them!